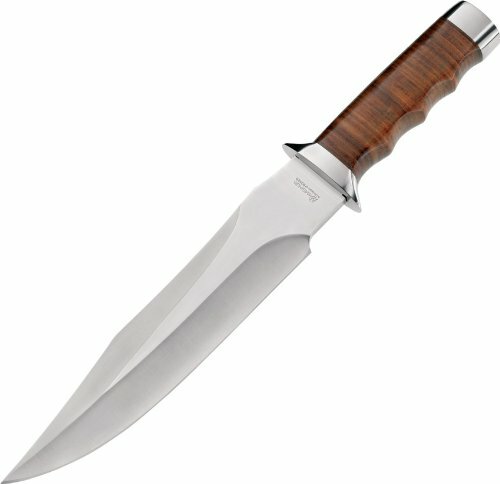 The Boker Magnum 02MB565 Giant Bowie Knife is a new interpretation of the legendary Vietnam style Bowie, with impressive dimensions. The 440 stainless steel blade features a precise grinding and is extremely sharp. The guard and pommel are made of polished stainless steel, and the genuine leather handle features soft finger grooves, which tops off the overall look of this classic piece. Blade length: 8 1/8 in. Overall length: 12 5/8 in. Weight: 11.6 oz. This Boker Magnum knife isn’t just for cutting, it’s for leaving a mark. Limited lifetime warranty. A chestnut tree is the world famous trademark of the Boker knife manufactory in Solingen, Germany. It represents innovative, high quality, exceptional knives, manufactured with pride, by hand, for over 145 years. Blade length: 8.13-Inch . Weight: 11.6 oz.